Bring new Positive Energy into your home with the Unique Startonight Large Canvas Wall Art. The artwork have the unique property of glowing in the dark. In the presence of any source of light, only 30 minutes would be enough to be fully charged with luminous energy. Then, when evening comes and it gets dark, it will radiate a warm and discreet light. The easiest test is to take the painting into direct sunlight and keep it there for 1 minute and then take it to a dark place, with no light. 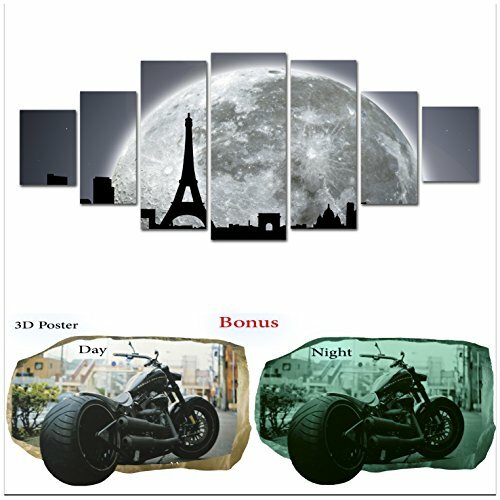 Box contents : Oversize Canvas Wall Art, Installation template, Hanging accessories, 5 stars glow in the dark, 3D Mural Poster Free Gift. Imagine yourself while you immerse in to a new world of silence and peace and choose the way to the light!